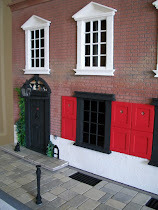 I've been adding character to The Tenement - hundreds of years of soot and weathering. The process was completed with acrylic paints and two coats of matt varnish. Hopefully I've managed to achieve a similar effect to that shown on the picture of the actual building to the right. The lonely little tile (on the left hand corner of the roof) will be added to soon, I just put it there to see the effect. 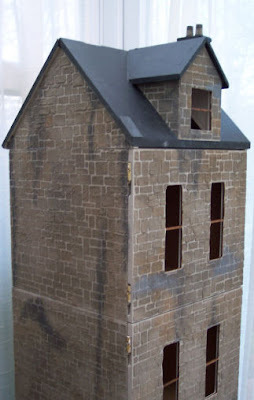 I'll be using real slate for the roof as, being a smallish roof, I wont have any problems with weight. I've taken a closer view of the chimney to show the chimney pots. These were purchased from Miniatura in October. I'm very pleased with them. They add just that touch of realism needed. 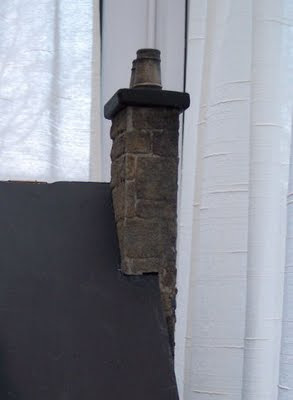 The chimney stack itself has been given a generous coating of "soot" - identical to the real Edinburgh tenements. Due to the close proximity of the buildings and the large number of them, there was a constant pall over the city which earned the town the nickname "Auld Reekie". In an earlier post I showed a picture of the full length of The Tenement including the ground floor which will be the Cloth Merchant's Shop. * In my enthusiasm with the stonework, I got so carried away I inadvertently stoneworked the door to the Shop. I did say at the beginning of this blog that I would own up to any mistakes - well this is it! 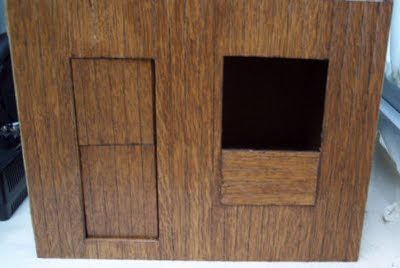 The Shop front is actually panelled wood. Luckily I noticed the error in time and was able to rectify the mistake so all is good. I have also removed the pieces in the window frame and will be putting in leaded glass when it arrives. * Circa 1617-20 the Cloth Merchant's Shop was occupied by a Mr John Riddoch (taken from Gladstone's Land - The Story of an old Edinburgh House by Robert Hurd).